"I like images of extreme humanness, " states Saville about the inspirations for her luscious, fleshy, generous paintings. From Rubens to De Kooning, Soutine to Bacon-- Saville's work expounds on the grand tradition of figurative painting, yet feels thoroughly contemporary in gesture and subject matter. Tackling the weighty issue of female representation in painting and challenging conventional notions of female beauty in her work, Saville has advanced the discourse of painting and signaled its relevance unlike any other painter of her generation. In Figure 11.23, Saville faces portraiture head on. 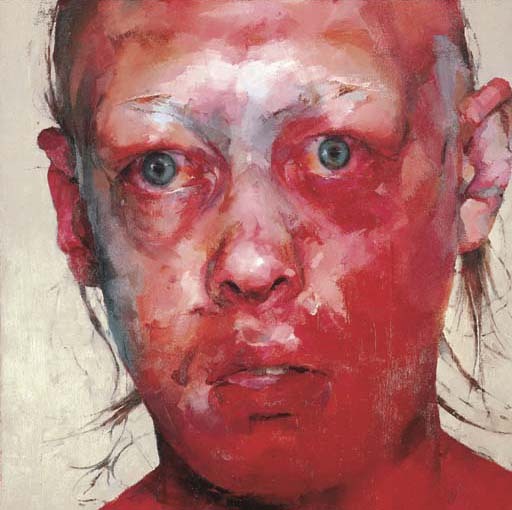 A broad, open face of a young woman is rendered with violent and fleshy reds, tender pinks, while dull putty and beige swaths give depth and softness to the skin. Light blue around the third eye make her look simultaneously pensive and stunned. The redness of her face seem to exaggerate the condition of blushing to the point of bleeding. The tradition of women as the subject of portraits is one of self-conscious sitters awaiting the male gaze. Figure 11.23, whoever she maybe, is rendered in immediate, intimate terms and is spared the conventions of femininity, beauty and coyness.